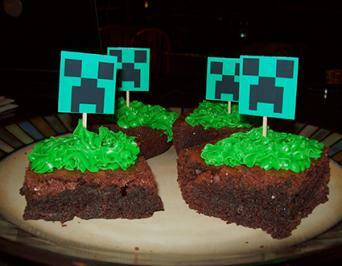 Young fans are frequently choosing Minecraft as their birthday party theme. Unlike most popular themes, there are not any licensed party supply items available for purchase. This can be quite a quandary for party givers; however, with a little direction, time, and creativity, you can throw an amazing party. Create Minecraft themed cards to help set the mood for the party. Turn a Minecraft themed papercraft card project into a themed invitation. Use the template to create the Creeper pop-up card and then glue party details to the back side. If you're a bit technically savvy, consider creating your own invitation with the birthday boy's or girl's Minecraft skin. Go to Nova Skin, choose your wallpaper and input the birthday person's gamer tag (user name) into the appropriate box. Once the wallpaper is created, download it onto your computer and add the rest of the details with photo editing software and print. Birthday Buzzin has a free printable invitation with a Minecraft theme. Simply click the link and print the invitation. Write in the party details before delivering it to guests. Think beyond Creeper green balloons and black paper streamers to create a Minecraft environment for a party space. Grass mats: Tissue paper place mats look like grass reminiscent of the grass blocks used in Minecraft. They add color and interest to the main table. Green paper plates: Since the Minecraft world is composed of blocks, green square plates are the perfect addition to the party table. 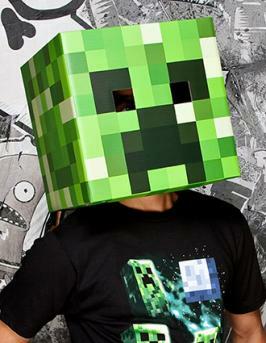 Creeper head centerpiece: For about $20, you can purchase a Creeper head mask that can be used as a centerpiece. FPSXGames: Print four pages to create a large Stampy Cat character. Although Stampy's not a character in the original game, the player who takes on the character is very popular. Minecraft Fan Club: Find lots of previously mentioned characters in foldable form here, along with other figures like the wolf, blaze, anvil, and more. Wall decorations are a great way to add color to the party area and to help reinforce the theme. In the game, the Nether Portal is the entry way into the Nether, the underworld. Create your own Nether Portal using black and purple plastic table cloths, available at party supply and dollar stores. Cover a door in a black table cloth and tape a smaller rectangle of purple table cloth into the center. You can also make a fringed doorway by hanging the table cloths (so black is on the two sides and the purple in the middle) and using scissors to cut one inch fringe from floor to about three inches from the top. Decorate party venue walls by hanging scary Endermen. Hang two black paper plates, one on top of the other (vertically), to create the head and body. Then cut two purple eyes from construction paper and glue them to the head. Use black streamer to create arms and legs and then tape them to the wall. There are plenty of food within the game of Minecraft. This is good news for a party planner trying to figure out themed food for their soiree. 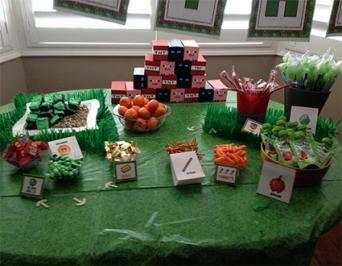 Serve Minecraft themed food in a buffet style. Here is a list of food found in the game of Minecraft and Use real life food you can use to represent it. There are other game elements that can be interpreted as food items. Carrots: Serve baby carrots or stock-up with carrot shaped candy from the after-Easter sales. Sticks: Pretzel sticks are good representatives of this Minecraft element. Apples: Apple slices or whole apples are the obvious choice to represent this fruit, but you can also serve apple sauce or caramel apples too. Fish: Fish shaped food is a fun addition to the party buffet. Look for gummy fish or fish shaped crackers. Gold: Let guests collect gold by filling bowls with gold foil wrapped candies. You can also serve butterscotch candies to represent gold. TNT: Wrap red licorice sticks with a wrapper that is labeled with "TNT." There are lots of ways to represent a Minecraft cake at your party. Grass block: A simple chocolate cake with green frosting is a good way to represent a grass block from the game. You can frost the sides with chocolate frosting or leave them without frosting so that the chocolate is exposed to look like dirt. Minecraft game cake: There is a cake in the game that is fairly simple to mimic in real life. Bake a white cake in a square pan. Then frost the top (and partially down the side) with white icing and use red squares of fondant to decorate the top. Sheet cake with toppers: A standard sheet or round cake can be turned into a Minecraft themed cake simply by placing one or two small Minecraft themed toys on the top. You can purchase these small toys online or at some retail locations. Simply print and cut these topper images and tape them to wood skewers or toothpicks and stick them into cupcakes. 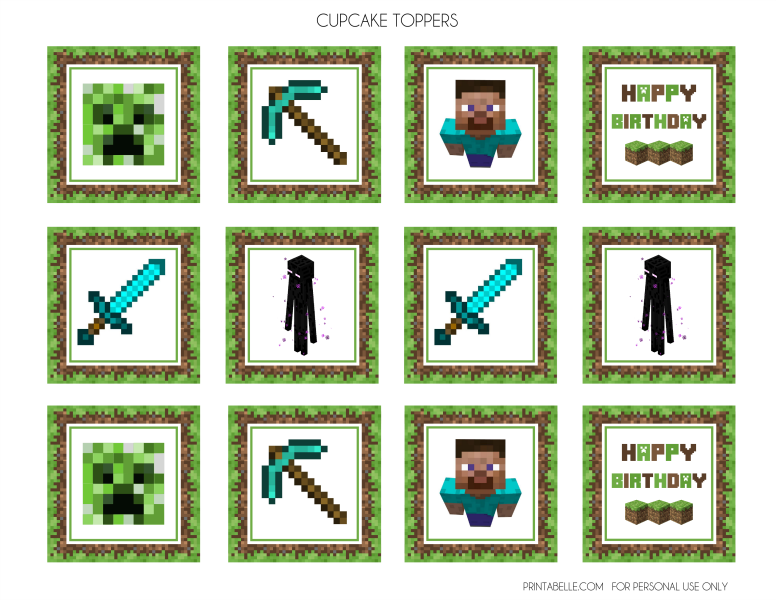 Steve, Creepers, and other characters: Simply print and cut these square cupcake toppers. There are 12 toppers on this sheet. TNT, Steve, sword, pig, and others: There are 12 toppers on this sheet. Print, cut, and glue these toppers onto toothpicks. Steve, Creeper, sword, and others: These toppers are 2x2 inch squares. Consider printing double the amount of sheets that you need and gluing two toppers together, back-to-back, to create a two-sided design. Games and activities help keep guests happy and having fun. Choose these Minecraft games and activities to keep even the Creepers happy. Mining is a big part of the game of Minecraft, so its a natural element to add to a themed party. Ask guests to mine for gemstones by filling containers, such as a planter or mixing bowl, with sand and plastic gem stones (available at craft and dollar stores). Purchase small axes at the local dollar store and invite guests to mine for gems. For older children, have one or two different colored gems that, if found, can be exchanged for a prize. Buy green styrofoam floral blocks from the dollar or craft store and create Creeper faces by attaching stripes of black duct tape. Stack the Creeper blocks into a pyramid. Then invite guests to knock the blocks over using a ball, toy bow and arrow set or a squirt gun. Prepare the party area by hiding game specific items for guests to find. Then create a list of items that must be located and paper bags for the guests to put the items into after they are found. Be sure to hide several of each item and always allow the youngest guests to go first. Here are some suggestions for scavenger hunt items. Send party gift homes with guests to help them remember the party. Simple green gift bags can easily be turned into a Creeper bag by drawing the face design on the bag with black marker or with black duct tape. Fill the bags with green or gold wrapped candy, red licorice wrapped with paper with "TNT" written on it and ring pops. Inflatable pickaxes: This 12-pack of inflatable pickaxes is around $11 and could be used as a favor or a party game prize. 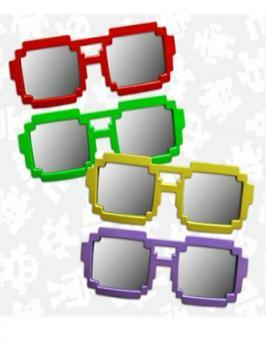 Pixel party favor glasses: Order these cool pixel shades in a pack of 12 for just over $20. Inflatable torches: At about $14 a dozen, these inflatable torches would make a great addition for a Minecraft goody bag. If you want to educate yourself about Minecraft prior to planning the party, check out the Minecraft Wiki page. This will help you learn about the game and will be a good inspiration for creative party planning ideas.